If you live in Los Angeles long enough, you get involved with moviemaking. I lived there for five years and made my share of short films. It’s a rush to take an idea from start to finish. Because failure lurks at every corner when making even the shortest of movies, some initial naiveté is an efficient vaccine against giving up before you begin. What I enjoy most about the process is challenging myself with a new facet of filmmaking on each project. In general, I concept, write, direct, produce, shoot, and edit everything. But when I find willing (and capable) volunteers, I ask them to fill those roles. The allure of this project was typical for off-hours creativity: I was excited about the concept and I thought I could produce the film quickly. I thought if Martha choreographed a dance and performed it identically in four locations, then I could simply switch between the scenes and have my final cut. However, once we got to our locations, I realized I hadn’t anticipated needing to make her body size and the distance she travels be identical in the video frame at each location. It seems obvious in hindsight, but it caught me off guard. When we arrived at our second location, I realized the difficulty of matching the exact sizes. To solve it, I placed masking tape on my camera’s screen to create guides where Martha’s head and feet hit during the first location’s recording. Then I made sure she fit the same way in the frames. It was a little imperfect, but good enough to get the effect. Double trouble: neither Martha nor I considered marking spots along her travel path where she should hit certain choreographies. That would have helped halfway into the video when the different locations start showing a disparity in her linear progress. So I came up with the ghosting effect while I was editing to make up for some of the error. And the gotcha of the film in the final few frames? I added that to the storyline while I was editing because I thought it needed a punchier ending than she had choreographed. For fun, I sent this to a friend who was running a dance film festival near Seattle and Route was selected for showing! After six months of running an improv street comedy group, I decided to involve some extra talent and shoot this short. The idea spun from seeing the same lone security guard night after night standing outside the UPS shipping depot near my apartment. I thought it would be fun to show up and spread some cheer. I sang the melody I had in mind to our lead musician and then the band took it from there. I managed to get another dance friend to choreograph a dance and teach the rest of the willing but non-dancer crew how to perform it. The biggest challenge, after rehearsals, recording a master track, and planning the logistics of the one-night session, was ensuring that we’d have at least one “safety” scene where I knew we could pull off the stunt. Keep in mind, this was before flash mobs and YouTubers were commonplace entertainment, so failure was a real fear. My answer? One of the scenes in the film is what I like to call “Hollywood magic”–it’s completely staged. But the rest are totally genuine. Everything about stop motion is difficult and time-consuming. I collaborated on this project with my girlfriend for a Friday night date. We made and colored our own clay from scratch, came up with a story, built our set, set the lighting, and laboriously shot each frame with a DSLR. We worked late, late, late into the night. The next day, I found the soundtrack online and edited the film. In sum, this took us about 15 hours to produce. It’s one of our favorite memories and we love sharing it with friends. 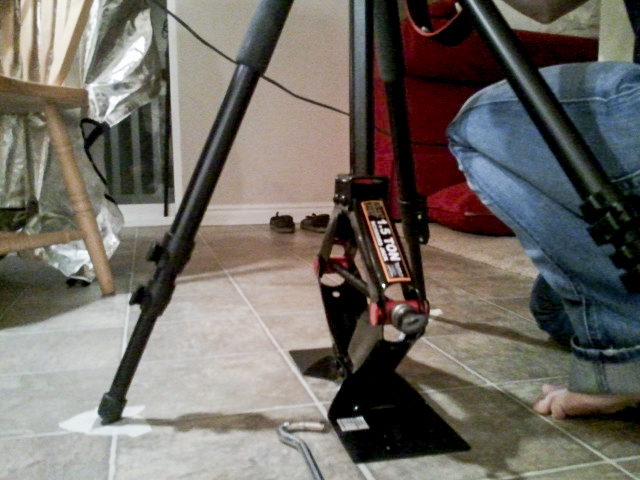 At one point, we couldn’t get the tripod head to sit perfectly, so I had to use the jack out of my car for support. Not every short film I attempt ends well. This film involved too many unknowns and I floundered. For zero dollars, I managed to assemble a live band, a troupe of college modern dancers, a professional dance instructor, costumes, six different camera rigs and jibs, a set of film lights, industrial grade air fans, a professional audio recording engineer, and an amazing spiral staircase. My concept was to have a camera flying through slow motion dancers moving up and down the staircase using a variety of camera gear. For example, I built a custom portable dolly out of rollerblade wheels from the local skating rink that was meant to glide along the staircase’s winding handlebar. However, I completely misjudged the technicalities of working in slow motion. I knew it wasn’t going to work as soon as I saw the first of the footage in my editing software, but I owed it to everyone involved to at least make an attempt. I cut this draft and sent it to the choreographer for her feedback. She was polite but hinted that it wasn’t really working. I tried to shoot and incorporate additional nature footage in hopes of some sort of artistic salvation, but I finally came to the conclusion that this project wasn’t going to progress to anything I would be proud to share. In retrospect, I don’t fault my ambition. I’m glad I went for it. But the lesson I take away is that I should run a few tests before involving the time and talents of so many other people. I’ve made other films since these. I am humbled consistently with each project that people trust my vision and plans without knowing fully what the final product will turn out to be. Of all my learnings, that is my greatest–to trust others in their projects. Such a level of trust can propel a person into new adventures and personal growth otherwise inaccessible to them.